Coquelin’s role is unlike that of any other in modern football bar perhaps that of Real Madrid’s Casemiro. That’s​expected given the cobbled-together nature of both sides, who sometimes get through matches by pure bolt-on talent (though Madrid have the benefit of having more than two world class attackers). Yet, Casemiro admits that sometimes he has to go beyond his remit of breaking up play and contribute to building-up. For Casemiro, it’s also a survival tactic. Previous water-carriers have been discarded for not doing enough – or doing too much (Xabi Alonso) – therefore a balance has to be struck. Casemiro lets the others shine by what Julen Lopetegui describes as “disguising his limitations.” Coquelin, on the other hand, functions by not confronting them at all. So far in Arsenal colours he’s yet to register an assist or score a goal. Passes per ninety are also in their low 40s, and you’re only like to see one or two successful long-balls per game. What he does best, though, is to survey play ahead of him like a shark when it sees feet dangling beyond the surface and then propel himself into tackles with a muscular ripple. There’s no doubt there’s a visceral joy when he does this but often he’s also the least visible player on the pitch. 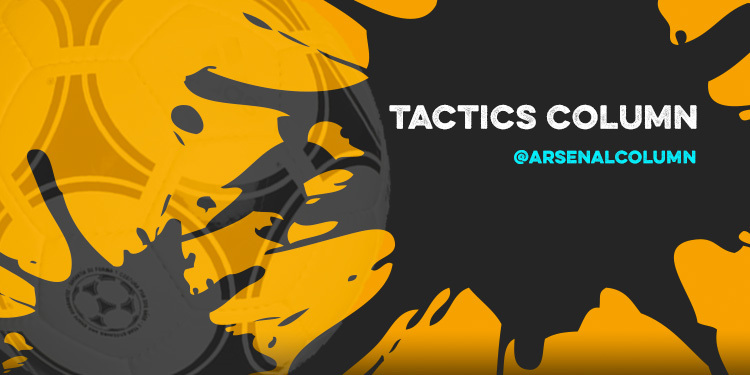 That’s partly because Arsene Wenger tends to use him this way, as a decoy almost, dragging opponents with him when Arsenal have the ball at the back or in midfield so that it opens space for the other attacking players to receive the ball. (I’ve written about this tactic extensively, so search through my archives to find more on this). This season there has been an evolution of sorts in terms of Coquelin’s role, playing more in the final third, almost as a false number six. That is to say he’s been pushed further forward into the attacking half of the pitch not to make any direct, consequential actions as such but more as a knitter of play, via sharp bursts and short, little passes. The aim then, is that if the ball comes loose, he’s there to win it back quickly, whilst being high up the pitch, it distracts attention from the likes of Mesut Ozil and Alexis to pick up the ball in dangerous areas. Since the turn of the New Year, though, with Wenger reverting to a more pragmatic style, Coquelin’s presence in the team has served almost to get in the way. Indeed, it can be argued that with him, Arsenal play with one less player in possession because his brief is to distract rather than create. However, Coquelin’s performance against Stoke showed promising improvements. For one, his bursts into the final third seemed to be done with more purpose. Robert Pires once commented that Coquelin is “clever with his movement” and indeed, his decoy role often puts him into good positions; it’s just that it often lacks intention. Here, he found himself in the box a couple of times, most notably when attacking the cross that Monreal ended hitting the post with, but mainly he provided effective support to the wing-backs when the ball got into wide positions. Given the switch to 3-4-3, this was really useful in helping Arsenal build properly because they had that man in the “halfspaces” that are said to be crucial these days. At the same time, it allowed Monreal to push really high up and be a threat whilst Alexis was able to roam infield. Indeed, it’s no coincidence that having this improved “structure” in possession resulted in Alexis with a better pass accuracy than in recent games at 84% (compared to 74% against Southampton and 78% v Man United). 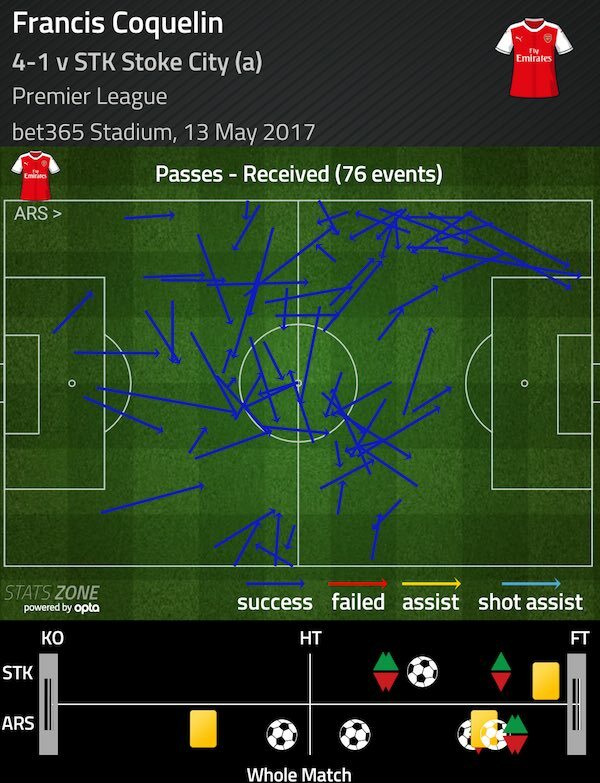 Coquelin’s passing was much more impressive also, and he had a crucial part to play in the opener, playing a neat, incisive pass to the other wing-back this time, Hector Bellerin, who squared the ball to Olivier Giroud to tap in. Perhaps he was made conscious of the need, as one of the box-to-box midfielders in the 3-4-3, to make an impact at both ends of the pitch. Indeed, it feels as if he’s in danger of slipping behind, especially against the performances of his peers in the ball-winning box-to-box, Victor Wanyama and N’Golo Kanté who it feels like each game, are being provoked by their managers to go the extra level and create also. Coquelin has the talent; in reserve level Wojciech Szczesny used to say he was “always the best player”. Like Wenger says, it took Coquelin a while to realise what type of player he is to allow him to break through, but now that he’s got his foot in the door, it’s time to establish himself as a proper, fully-formed number six. Certainly the 3-4-3 seems to suit Ramsey more than any other Arsenal midfielders, and it seems to have also had neutralising effect on Granit Xhaka’s attendant rashness. Chasing back is not a problem anymore, and now he can concentrate on building play, “passing from deep areas through the lines”. The way Arsenal defend still demands him to abandon his position and press up the pitch with the forwards though against Stoke, their seemed obvious improvements in the positioning of Ozil and Alexis who took up better inside positions to clog up the service to Joe Allen in particular. In the end, victory was mostly comfortable. Stoke rallied for a bit, but Arsenal held firm at the back, and then allowed the magic of Alexis to change the game. The link-up between him and Ozil for the second-goal was excellent and he later added the third. A quick break saw Ramsey find Giroud to wrap up the win and it looks like Arsenal are finally settling into the formation. As Wenger said at the end of the game, both Ozil and Alexis have blossomed in their new roles and it seems the promise to develop individuals is a strategy that he uses to foster commitment to the club. Francis Coquelin has recently signed a new contract, and here’s hoping there’s still more developing to do, whether that’s under Arsene Wenger or not.